Today in an incident that brought up horrible memories of the 2007 massacre on Virginia Tech's campus aside from being horrible in its own right, two people were shot and killed at the university. The school was put on lockdown for four hours this afternoon, which was particularly rattling for students, faculty, and staff who were on campus four years ago. However, unlike last time, the school is being praised for quickly warning the community about the threat and keeping everyone informed throughout the day. The New York Times reports that today a man walked up to a campus police officer and shot him as he was making a routine traffic stop in a campus parking lot. The man took off down the street toward another parking lot, where police later said they found a second body with a gun. Authorities haven't confirmed the details yet, but it's believed that the second man was the shooter, who had turned his gun on himself. When Seung-Hui Cho, a Virginia Tech student, shot and killed 33 people including himself on April 16, 2007, the school was criticized for letting two hours pass between when the first victims were found and the time they sent a vague notification about a "shooting incident." In a strange coincidence, school officials were in Washington today testifying in their appeal of a $55,000 Department of Education fine for failing to warn students during the first attack. The response today was entirely different. According to USA Today, the shooting of the police officer was reported around 12:30 p.m., and six minutes later a campus alert went out by text, e-mail, and the university's Twitter page and website. The school's public address system said, "Gun shots reported … Stay inside. Secure doors." About 10 minutes later a second alert said the suspect had on, "gray sweat pants, gray hat w/neon green brim, maroon hoodie and backpack." In four other alerts issued while the school was on lockdown, school officials said an officer had been shot and there was a second victim. 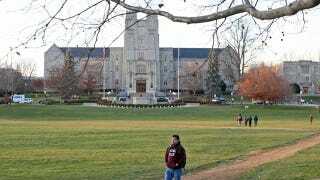 The campus alert system was updated at Virginia Tech and many other schools in the wake of the 2007 attack, and it's encouraging to see that the changes were effective and prevented today's incident from becoming an even bigger tragedy. As for the slain officer, whose name hasn't been released, officials say they don't think the gunman knew him or the driver he pulled over. Charles W. Steger, the president of the university, called the shooting a "wanton act of violence," adding, "our hearts are broken again."